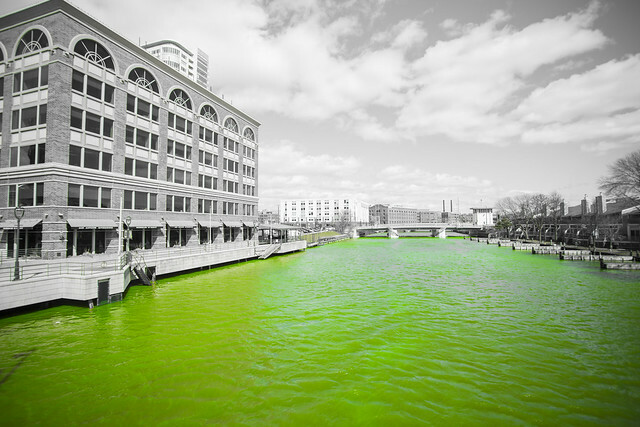 The Milwaukee River went green this afternoon - but that&apos;s not all that&apos;s gotten into the #FearTheDeer spirit. Published April 12, 2019 at 5:56 p.m. It's not easy being green – unless you're the Milwaukee Bucks, of course! 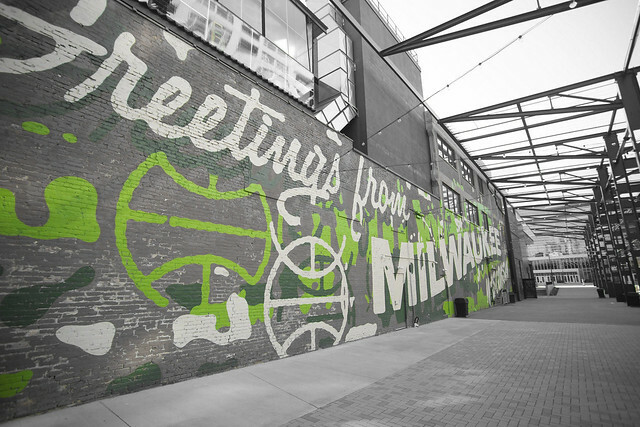 Ahead of their first round of the 2019 NBA Playoffs, which kicks off on Milwaukee Day (4/14) against the Detroit Pistons, the Bucks turned the entire city green to celebrate the team's impressive regular season and their promising playoff run to come. Bucks pride will extend beyond Deer District. 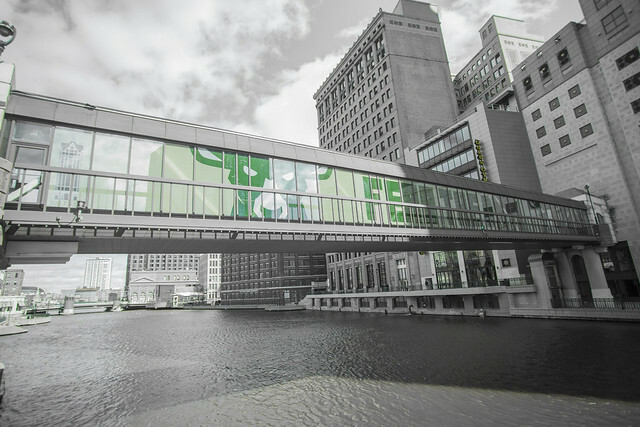 To kick off the start of the NBA Playoffs, two Downtown skywalks were decked out with huge Milwaukee Bucks branded decals. Attached to the building at 100 E. Wisconsin Ave., the "Fear The Deer" bridges hang over Water Street and the Milwaukee River. If you haven't taken a ride on The Hop yet, now is your chance to do so while also cheering on your Milwaukee Bucks. 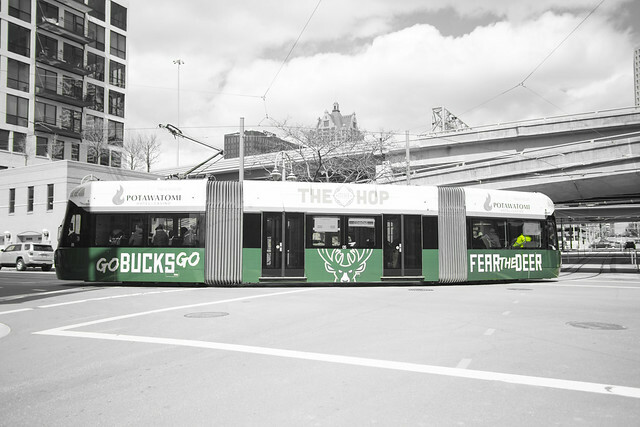 On Friday morning, the city debuted a Bucks-themed Hop car, complete with Bucks-branded decals inside and outside of the streetcar. The team celebrated the Bucks streetcar on Friday in the Third Ward with an appearance from Bango, the Bucks Entertainment Network, Mayor Tom Barrett and Bucks Senior Vice President Alex Lasry. Bango and company will also make additional surprise visits to businesses along The Hop's route throughout the playoffs. The Milwaukee River looked like downtown Chicago on St. Patrick's Day, as the Bucks teamed up with the Department of Natural Resources on Friday to dye the river green in celebration of the playoffs. The non-toxic and eco-friendly dye was spread by boats who made numerous laps between the McKinley Avenue and Juneau Avenue bridges to dye the river a bright green before the river flow and 20 mph winds returned the river to its natural color. With winter returning this week, the Fiserv Forum put on an extra layer with a huge new mural ahead of the first round of the Playoffs. Giant headshots of Giannis, Bledsoe, Lopez, Brogdon and Middleton now greet fans as they enter the arena, so the sixth man will be ready to cheer on the Bucks for a lengthy playoff run. If you couldn't score tickets to the first round, fear not because just a few feet outside the arena, fans can throw on their Bucks gear and enjoy the playoffs at Fiserv Forum's entertainment plaza. Watch the games on a 40-feet high screen and party at Deer District's beer garden and plaza with food, games, music and even chances to win playoff tickets and more. Fans can also enjoy the team's away games in the series at the entertainment plaza. Light it up, light it up – and by "it," we mean the BMO Harris Bank office building Downtown at 770 N. Water St. 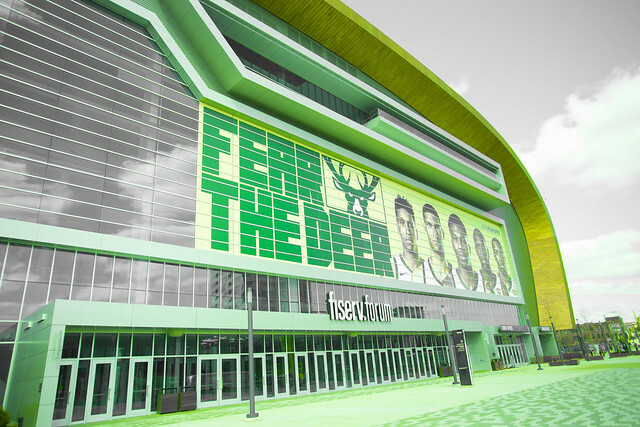 The 20-story tower now boasts a huge 18-story "Fear The Deer" display on its west-facing windows, which will remain lit throughout the first round of the 2019 NBA Playoffs, a beautiful sight to see after the sun sets.